This might be a shocker especially to my FIL but yayyyy today is our 8th year wedding anniversary.. Alhamdullilah.. we are still very much in love ahem ahem and we are happy with one-another.. one thing's for sure.. we are who we are.. we cant change our partners' behavior .. we learn how to accept.. Sometimes i wish we were leading a "drama-less" life but i wouldnt want to change anything.. .... we talk.. we argue.. we laugh and we cry.. we 'debate' most of the time simply bec we hv our own set of mind.. which come to think of it.. thats where Sonia got her "very opinionated" character..
To my dearest hubs.. Happy 8th wedding anniversary.. thank you for everything.. for being there whenever Hairi needs someone to talk to.. for being there when i needed a shoulder to cry on.. for being a wonderful dad to my kids.. may there be more wonderful years to come.. lap u many many ok! So enough of the boring speech.. heres the cake that i managed to bake especially for him.. a cake that consists of chocolate honeycomb, caramel and also cream cheese.. sounds good?? hehe.. hubs loved it very much.. for the caramel topping.. i decided to use Donna Hay's caramel sauce recipe simply bec i had been looking at it since i bought her new magazine.. hubs said the caramel sauce.. the crushed chocolate honeycombs added more texture and taste to this cheesecake. - Preheat the oven to 325 F. Line an 8 inch square baking pan with parchment paper or foil allowing a little overhang and spray with nonstick cooking spray. Set aside. - Mix the melted butter and graham cracker crumbs until thoroughly combined. Press the mixture into the bottom of the prepared pan. Bake in preheated oven for 6 minutes. Remove pan to a cooling rack. Do not turn your oven off. - In ur food processor. whisk cream cheese and sugar till creamy. Beat in the eggs one at a time making sure it's well combined before the next addition. Add in condense milk. - Add in whipping cream, cake flour, salt and vanilla extract. - Pour half of ur cream cheese fillings on ur crust. Drop dollops of "Dulce De Leche" on top of ur cream cheese mixture, sprinkle with some chunks of cut honeycomb.. Pour another portion of ur cream cheese filling and drop dollops of "Dulce de Leche" and chunk honeycomb again. - Bake at 160C for about 60 mins. or till set. - Leave to cool before slicing. Place the butter, sugar, golden syrup, cream and rum in a saucepan over medium heat and stir until the sugar us dissolve. Bring to the boil and cook for 10 to 12 mins or until thickened.. allow sauce to cool bef pouring over the cake to serve. 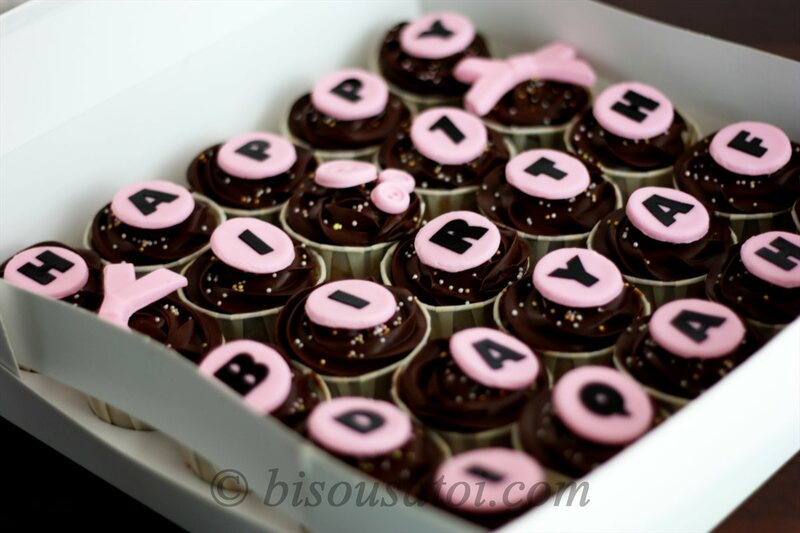 Ok these were the cuppies ordered by Andik.. ty and am glad to hear that ur 17 yrs old baby girl loves it.. Happy bday Afiqah!.. to Wati.. ty for the macs order.. sorry we didnt really get to properly say hi..
Hv a wonderful monday peeps.. am looking forward to this weekend where we will be flying to Bali - woot woot!! happy anniversary to a gorgeous couple! May you have many many more wonderful, joyous and loving years ahead of you. Congratulation kak Rima & hub. May your day filled with love and igpt goes eternity. cam mane kak rima buat tuklisan kat cupcake tu? alhamdulillah and congrats. Wishing you loads of happiness and love. Happy Anniversary Rima & Hubby. The disc n lettering are all made out of fondant..
Nampaknya 'polkadot' very sinonim dengan I, har3. You can have mine. You kuis2 aje pasir kat tepi pantai tu. Dah lama I tanam kat situ, tunggu warisnya datang aje, ahaks. Happy wedding anniversary to you n hubby dgn ucapan "makan dessert aje pun tak bagus. Takkan makan manis aje; kena makan savoury juga .. harus masin, masam, pedas. My wed.anni. pun bulan April jugak. Happy Anniversary to u and ur luvly hb ;) My marriage pun ada drama mama jugak. Sampai I lari rumah 2 kali tau hahahaz. Tapi terpaksa balik sbb takde sedara mara dkt sini. Anyway tu dulu...skarang dah tak kuasa nak bertekak dah. Saper2 punya rumah tangga yg takde drama...I mmg nak tabik dkt dorang lah...cobaan. hepi anniversary kak Rima..da 8 tahun kan..jap je mse berlalu..semoga jodoh berpanjangan ke syurga..Amin.. Alhamdulillah...!!!!! Happy Anniversary Mr n Mrs Aue.... May u have a blissful life together. And and awwww, so sweet words from u to him... Hahakss.... Im counting down... 5 Months to go... Weeee...!!! Anyway, chocolate honeycomb tu nak dapat dari mane eh? Thanks kak. Enjoy ur Anni..!!! p/s: Kak Rima, cau u recommend where can i get yummy dulce de leche in SG? for all the years of your lives!Not forgetting moga bertambah keimanan dn dpt membina keluarga bahgia dan sakinah...insyaAllah...amiin!! Happy 8th Anniversary! Enjoy in Bali. Ty everyone for the wishes.. Insyallah .. Am looking forward to my mini vacation in Bali n Jakarta..
oppsss sori.. ketinggalan erl.. happy anniversary ya rima.. smoga sentiasa kekal bahagia with yr darling dan dgn anak2 yg hensome dan sweet itu..
happy anniversary k.rima. waahhh mentang2 annivesary plus drama, buat kek eruption gitu! One word : May Allah bless you and family! haha.. deep down i dah agak you akan ke jakarta he he have fun k!! congratulation and Happy 8th Anniversary to Rima and Mr.Rima. May both of you stay in love forever and ever!!! haiyo sudah lama x singgah sini.. Happy anniversary. Semoga bertambah bahagia dan indah belaka. Ty Lenda for the wish . N welcome! Why long time no see u? Hope u r doing good.. Ty for the wish.. Amin..
Ty for the wish.. Am looking forward to Bali.. I wanna just chill.. Can't wait! Sorry for the late wish...but..
Yang penting, love each other always ya..